Step 1: Use multiplication to create terms that are opposites. We can create opposites by multiplying the entire 2nd equation by 5. This will give us a 5y and a -5y that will cancel. Step 2: Add the equations vertically. Now that we've created terms that are opposites, one of the variables will cancel out when we add the equations. The y terms canceled, so we can solve the equation that's left. Step 4: Solve for the second variable. 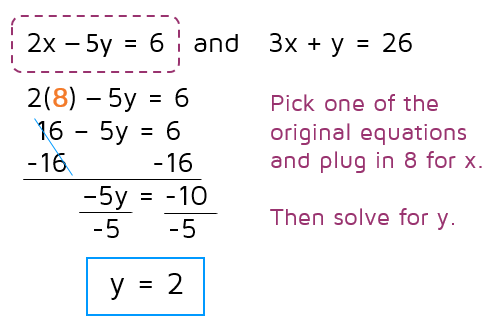 Go back to one of the original equations (you can choose either one) and plug in 8 for x. 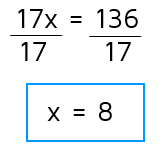 Step 5: Write answer as ordered pair. Make sure to put the variables in alphabetical order when you write the ordered pair. Step 6: Check your answer. 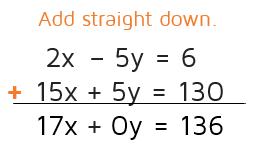 Use the original equation that you didn't use earlier. If you use the same equation twice, it will not find a mistake.